This is so important- thank you for sharing! Also want to note the point about *relaxing*— this is one of big reasons I got into yoga. Since practicing regularly, my blood pressure has lowered & my anxiety has decreased in a huge way. As someone who has a family history of heart disease, this is really good news! We have to prevent any way we can. Good stuff 🙂 Taking responsibility for your own health is the best thing you can possibly do for yourself, your family, your country and your planet. It is always good to hear how simple healthy lifestyle choices really improve people’s lives. Women, we have to be smart about our hearts. And not just when it comes to love. 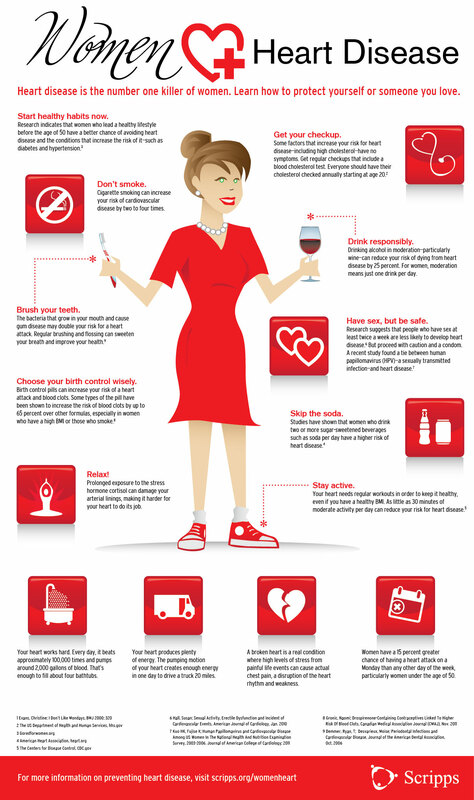 I stumbled across Schalk’s health blog and thought this infographic was too important not to share. Even if you don’t have a family history of heart disease, using preventative measures to keep your heart healthy cannot hurt! Yoga can be one of those ways to keep your heart healthy. Focusing on calming the mind during asana (poses), sitting in meditation, and restorative yoga can help to calm the nervous system and reduce anxiety.